Pet frogs, salamanders, toads, and newts are all types of amphibians. They are generally classified as types of reptiles. There are over 4,000 species divided into three groups (anurans or frogs, toads and treefrogs; caudatans or salamanders and newts, and gymnophionans. They are all aquatic in nature, with some living primarily in water and others living on land. Amphibians do not like to be handled, making ownership more about observation, care and constructing a proper habitat or terrarium. Handling can also harm the amphibian by introducing infection to your pet. 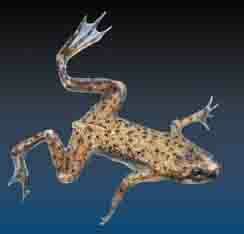 Frogs and toads are amphibians that do not have tails, a feature that differentiates them from salamanders and newts. Any terrarium needs to mirror the amphibians natural environment. This includes a substrate that holds moisture and a terrarium that contains the decor and features required to maintain a healthy animal. In general, amphibians are best kept in an acrylic container to make cleaning easy. Unlike reptiles, outside heat is usually not required. When it is, a heat pad can be used to heat all or part of the cage. Lighting should be with a low level UV light (2%), without providing too much UVB. All of the amphibians listed below can be purchased in either Pet Stores, online or at Reptile Expos. The Red-footed Tortoise: does well in captivity and is easy to care for. If one tortoise is being kept, a 55 gallon terrarium is needed. They grow to 12 to 13 inches and will live for 30 to as many as 50 years. They require a tropical environment. 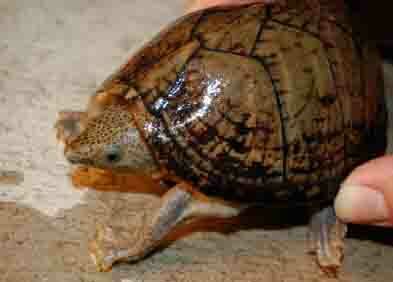 The Razor-backed Musk Turtle grows to 4 to 5 inches in length and will live to 15 years. They do well in captivity due to their small size and easier care requirements than other turtles (less dependent on full spectrum lighting and basking). The diet consists of snails, crayfish, minnows, worms and insects. They can also eat commercial turtle food. Pet frogs tend to be more closely associated with aquatic environments vs. toads. Treefrogs stand apart in that as the name indicates, they live around trees. Both pet frogs and toads breed in the water. An ornate Horned Frog (also called the Pac Man Frog) isn't for the owner looking for one of the easier to handle reptile pets. These pet frogs bite and will eat anything including crickets, wax worms and meal worms. Females are approximately 5 inches in length with males a bit shorter. The Ornate Horned Frog can live 12 years or more. They require a 10 gallon reptile terrarium. 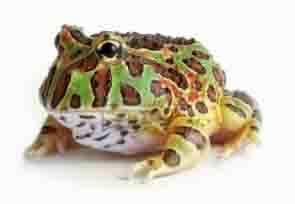 For more information download this brochure on the Ornate Horned Frog care and diet. The Oriental Fire-Bellied toad grows to 2 to 2-1/2 inches and can live to 10 to 14 years or older. The toad requires a 10 gallon aquarium with a 50/50 ratio of water and land. The FireBelly toad diet consists of crickets, waxworms and mealworms. These toads do well in captivity. They require a semi-aquatic terrarium. No outside heat source is required. The Fire Bellied Toad adapts will to home terrariums. Download this fact sheet on the oriental fire belly toad for more information. The Dumpy tree frog grows to 4 to 5 inches and will live approximately 16 years. These frogs need room, requiring at least a 10 gallon reptile cage. Any terrarium requires water and floating plants. The Dumpy Treefrog secretes chemicals from the skin, so it is important to wash hands after handling. The frogs eat crickets, worms, cockroaches and small pinkie mice.Any terrariums require higher levels of humidity. The aquarium needs to be escape proof. 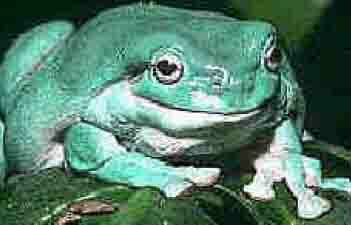 The Dumpy Treefrog has a jade green colors. This pet frogs skin secretes chemicals that scientists found can be used to treat acne and skin infections. Download this fact sheet on the Dumpy treefrog for more information. The Red-eyed Treefrog has big red eyes designed to startle anyone that sees them suddenly open. This frog east mostly insects such as crickets. Adults grow to 2 to 2.5 inches and will live 10 years or longer. They can thrive in a 20 gallon reptile terrarium can hold 2 to 4 adult frogs. The aquarium should contain a pond or waterfall. 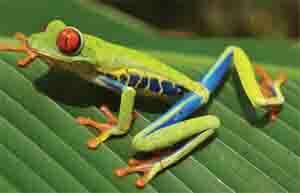 Like other frogs, the Red Eyed Treefrog eats insects such as crickets and wax worms. 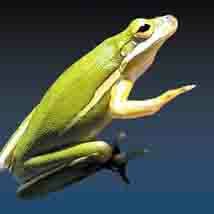 The Green Treefrog grows to 2.5 inches and can live for 6 or more years in captivity. These pet frogs will do well in a 10 gallon or larger aquarium. They thrive in a humid environment that contains strong plants that provide places to hide. They eat crickets worms and other insects. The terrarium should include branches for climbing. Download a helpful fact and Green Treefrog care sheet from Petco. The Dwarf Underwater Frog is unique in that it can live under water without ever coming onto land. They grow to 2.5 inches and live up to 5 years in captivity. The diet consists of bloodworms, sinking fish food pellets and fresh or frozen brine shrimp. They require a 10 gallon or larger aquarium, but could live in a smaller enclosure such as a 5 gallon aquarium. They prefer shallow areas. 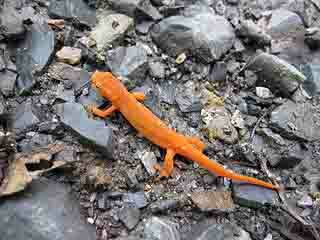 Salamanders and Newts are similar in terms of general characteristics. Newts tend to rely more on water than salamanders. Many differences are in the reproduction cycle. Salamanders require more land area in any enclosures. To retain humidity, wild damp moss is used as a substrate (floor covering). A water area or dish needs to be large enough for the salamander to become completely submerged. Water needs to be dechlorinated. During breeding season some species require a completely aquatic environment as noted below. 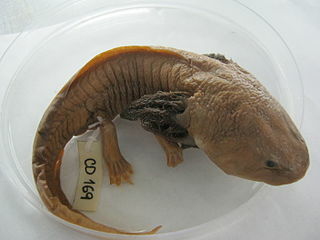 The Axolotl is an endangered species. They live completely in waters that are heavily vegetated. Tadpoles start life in the water. These reptiles are predators and will eat anything smaller in the aquarium. They will eat the limbs of other Axolotls, so be sure to only put one in a tank. Limbs do grow back. These salamanders are carnivorous and eat crickets, bloodworms, earthworms, and lean meat. They will also eat small fish pellets. The Axolotl requires a 20 gallon tank located out of direct sunlight. The Axolotl will grow to 7 to 9 inches and can live from 10 to 20 years in captivity. For more information, download this brochure on Axolotl Care from Best West (PDF Download). The Japanese Fire-Bellied newt grows to 4 to 5 inches and can live from 15 to 25 years in captivity. A 10 gallon aquarium can hold 1 or more newts comfortably. The newt requires a semi-aquatic aquarium that includes plants as it is almost 100% aquatic. The newt diet consists of pelleted fish and worms. This newt lives in cold water and feeds on insects and worms. They will also eat fish eggs, salamanders and their own eggs. 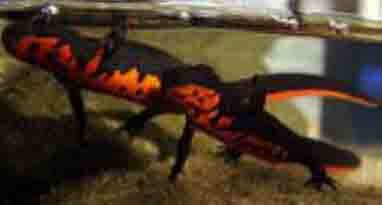 The fire-bellied newt is very active and easy to care for in captivity. The newt spends most of its time in the water. For more information, download this brochure on Newt Care from BestWest. Eastern Newts grow to 3 inches in length and can live for 20 years. They can live in a 10 gallon aquarium without any added heat. Have a Pet Frog or Amphibian Related Question for our Vet? We Will Answer it for Free! Do you need some frog, newt, toad, turlte, tortoise or amphibian advice? Just ask a question and our Vet will answer it as soon as possible. If your question is medical or behavior related, please include information such as species, age, diet, habitat and anything related to the medical history of your amphibian or reptile. Please upload a picture of your pet, especially if you believe it will help the Veterinarian. Please know that we receive many questions and answer them on a first come, first served basis. If you need an immediate response, we suggest you use this online veterinary service that is available now to answer your questions.